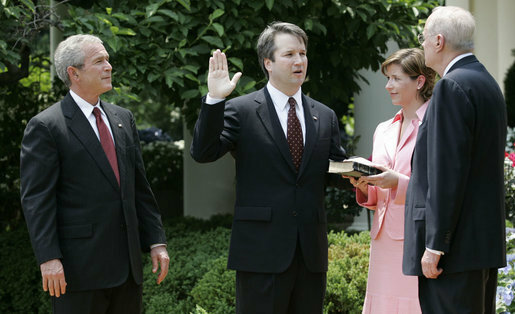 Kavanaugh worked in the White House Counsel’s office during the first couple of years of Bush’s presidency. That’s when Bush launched his “faith-based initiative” and the controversies surrounding it erupted on front pages. The initiative radically changed longstanding policies on how the government works with faith-based organizations that provide social services, like homeless shelters, job training, or foster care agencies. It wiped out church-state safeguards and allowed faith-based organizations that accept government grants to discriminate in hiring with taxpayer dollars. For example, a homeless shelter could get a government grant and then deny someone a job because she’s the “wrong” religion. Especially troubling, one of the initiative’s objectives was to allow faith-based organizations that got federal grants to ignore specific state and local laws that bar employment discrimination—particularly against LGBTQ people. Yet, according to emails from his time at the White House, Kavanaugh volunteered to be the point person to work on legal issues—such as proposed legislation and regulations—that were related to this initiative. In other words, Kavanaugh knew he was signing up to work on a policy designed to allow taxpayer-funded discrimination in the name of religion. In its zeal to permit taxpayer-funded hiring discrimination, the White House took some remarkably troubling actions. Although most of the legislation the administration pushed failed (Congress rejected it in large part because it allowed taxpayer-funded discrimination), Bush signed executive orders to do it unilaterally. The administration enacted scores of regulations and adopted policies to implement these discriminatory rules. But the White House ran into a few obstacles, namely that some government programs, such as Head Start, have explicit civil rights protections that won’t allow this exact kind of discrimination in employment. So, the White House lobbied Congress to roll protections back. At the same time, the White House looked for another way around civil rights laws. So the Bush administration turned to a law called the Religious Freedom Restoration Act (RFRA), and stunningly concluded RFRA meant faith-based organizations had a religious right to discriminate in hiring with taxpayer funds and could ignore those civil rights laws. In the next few years, the Supreme Court will be asked to decide whether to give religious exemptions to allow taxpayer-funded organizations or businesses to discriminate, including under RFRA. The court could hear cases involving businesses that want to use religion to justify refusing to sell goods to LGBTQ customers. Or foster care agencies that get millions of dollars from the government that discriminate against non-Christian families who want to provide homes to foster children. But we now know that based on his work on the faith-based initiative, Kavanaugh thinks it’s okay to use religion to defy nondiscrimination protections. Kavanaugh’s nomination threatens to turn the balance of the court so that religion can be used to undermine the rights of women, LGBTQ people, and religious minorities. That's why it's important that you urge your senators to oppose Kavanaugh's confirmation. He's wrong on church-state separation, and wrong for the Supreme Court.